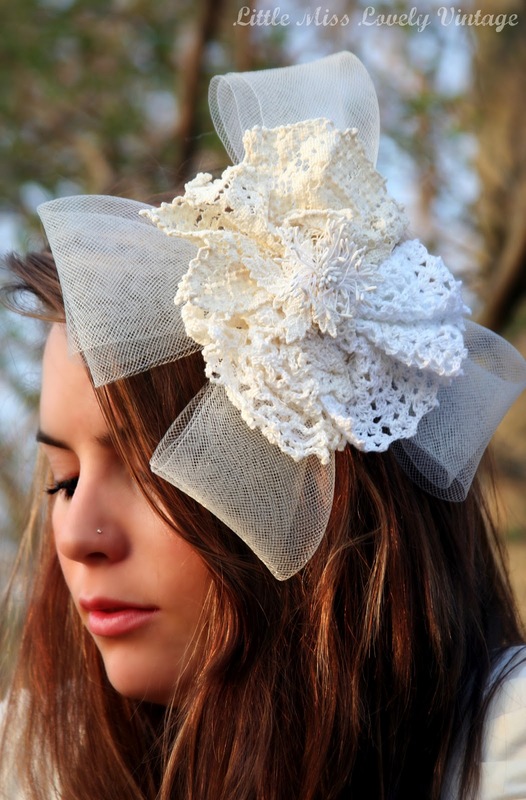 Cream feathered headband with pearls, vintage silk skirt by Little Miss Lovely Vintage. Some days are just meant for photoshoots. Things just come together so easily sometimes. This photoshoot was styled in less than 15 minutes, photographed and cleaned up within 45 minutes. Pretty crazy, right? Short, sweet, simple, and to the point. My lovely sister, Nikki, was kind enough to model some of my hand-made hair pieces on Sunday afternoon. She had just finished a day shift at work, came home, threw on some vintage clothing, and posed pretty for a little before dashing off for some quality time with her boyfriend. I was excited that I could actually get my sister to agree to do this for me. She and I don't always see eye-to-eye about somethings, but I do know that we both have an appreciation for creative projects, great fashion, and personal style. 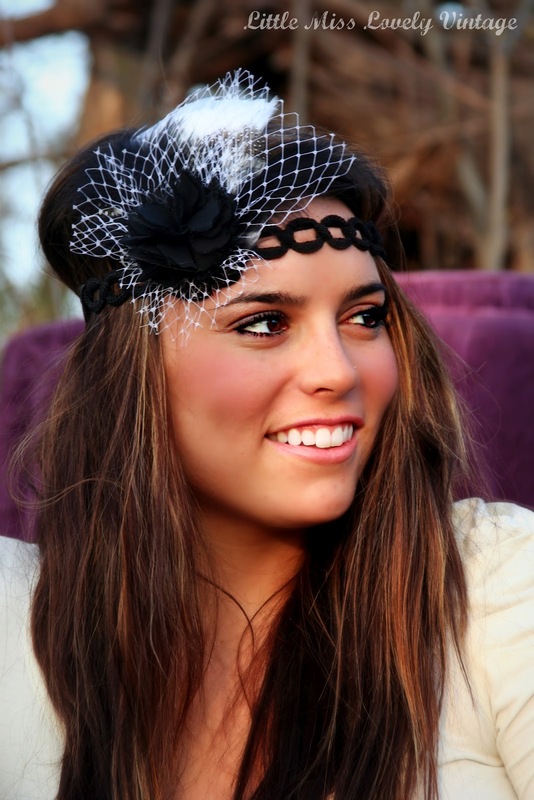 Black and white feathered headband with white tulle and a black silk rosette. Nikki posed gracefully next to a few of my favorite pieces... like that gorgeous purple velvet chair. We are lucky enough to have an 'in' in the local antique market. Some family members on our mother's side own and operate an antique auction. I've been known to purchase several truck-loads of antique furniture in less than 3 hours. Some people may think that it's irrational. I think it's saving a piece of fine, once-expensive furniture from the dump. This shoot was held in our parents backyard in Palmyra, PA. Nikki and I have always taken advantage of the beautiful scenery... we have the photos to prove it. I plucked handfuls of daffodils from my mother's garden. The hand-blown colored glass bottles are molded glass experiments from my glass-blowing days in college. The yellow and purple look fantastic against the muted brown and natural background. 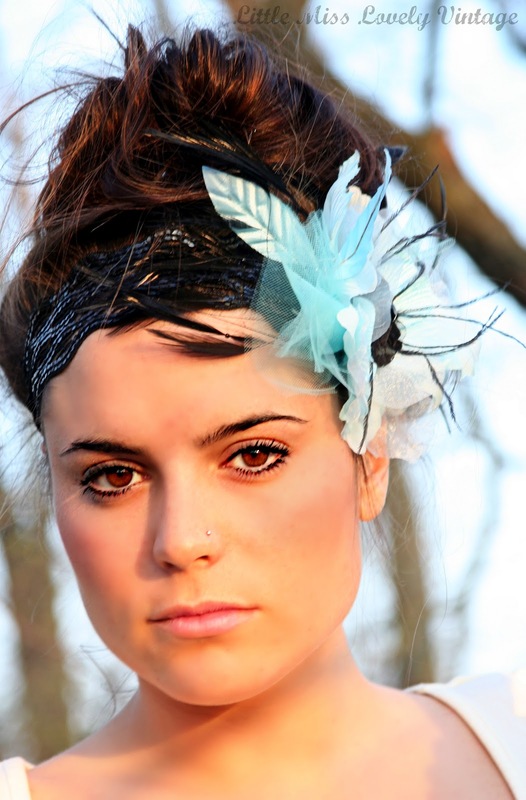 Baby blue silk floral, tulle, and feathered black headband. My sister looks beautiful. Thanks for sticking around so I could snap some photos of you, Nikki. It means a lot. Each of these hair pieces will be for sale at Borrowed Event on April 1st in Baltimore, MD. Check out the Borrowed website for more details (& for a contest)!